The holiday season has begun and one of the main attractions is the man in the big red suit. There are plenty of chances to visit with Santa Claus, get your photo taken, write him a letter, or enjoy some holiday tidings. We thought it might make your lives easier if we listed some of Santa’s hangouts in Greater Cincinnati. We know we don’t have all of his special spots listed, so if you know of any more then add a comment so we can keep on sharing some Ho, Ho, Ho’s. Also, it’s always a good idea to double check with the venue just to be safe Santa is still in the house. Head to the Kenton County Public Library‘s Durr Branch on Saturday, Dec. 3 from 1-3 and bring your own camera for a picture with Santa. Crafts and live music provided. 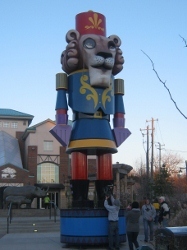 You’ll also find the BIG GUY at the Erlanger Branch on Sunday, Dec. 4 from 1:30 to 2:30. Bring your own camerea for photos, enjoy carriage rides and crafts. Both events are free. Visit www.kentonlibrary.org/events for more information. Ruth Moyer Santa House will be held Nov. 18 from 6-9 and Nov. 19 from 10-2. There will be games, crafts, baked goods and of course Santa. There is a fee associated with most activities at this event. Barn-n-Bunk Farm Market – Christmas open house – Dec. 3 (10am-5pm) & Dec.4 (10:30am-5pm). Have lunch with Santa on Dec. 3 . There will be pictures with Santa, face painting, cookie decorating, and more. 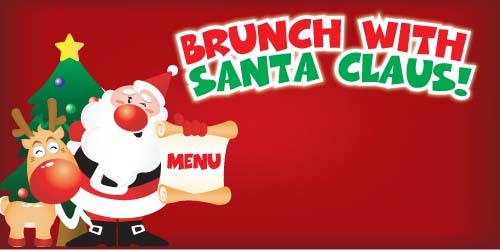 On Sunday, Dec. 4, you can have brunch and Santa & Mrs. Claus will be there to greet you from 10:30am-1pm. Click her for more details. Rt. 73 & Wayne-Madison Rd., Trenton, Ohio. Call (513) 988-9211 for more information. Bass Pro Shops – Santa’s Wonderland – Santa will be available now through Dec. 24 plus you can get a free 4×6 photo with him (you can also purchase additional photos). Hours for Santa are: Monday-Friday, 3-8pm, Saturday, 10am-8pm & Sunday, Noon-5pm. If you visit Monday-Thursday then the wait times are less to see Santa. There will be games, activities, and crafts too. Click here to pull up their event calendar to see all the holiday fun waiting for you. 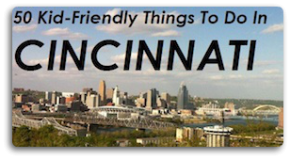 Located at: 300 Cincinnati Mills Drive, (513) 826-5200. Big Tree Plantation – This tree farm in Morrow really goes all out for the holiday season (Nov. 25-Dec.22). 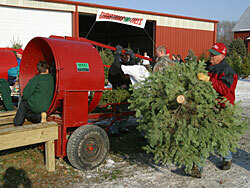 You can cut your own Christmas tree (or purchase a pre-cut tree) and enjoy some of their holiday festivities. Santa will be there on the weekends plus they will have wagon rides, carolers, kids winter wonderland, & visits with Mary & Joseph. They have a gift shop and cafe too – great way to start a holiday tradition. Plus they have free hot chocolate. 2544 South Waynesville, Rd., Morrow, Ohio. Call (513) 836-0975 for more information. Cincinnati Zoo & Botanical Gardens – PNC Festival of Lights – Open Nov. 25 – Jan. 1 from 5-9pm. Santa will be hanging out at the North Pole through Dec. 23. You can get your picture with him and let him know if you think you made it on the nice list. Last year, my girls were able to write Santa a letter and mail it in a special mail box at the Zoo. Near Santa will be the live nativity scene. 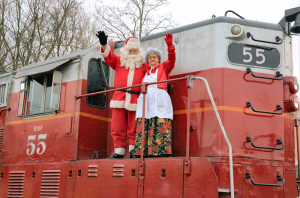 EnterTRAINment Junction – Take a “Journey to the North Pole” and see some amazing train displays plus meet Santa & Mrs. Claus. Santa is there from Nov. 19 – Dec. 24. Click here for ticket information (they also have a FREE winter train display that is open to the public). 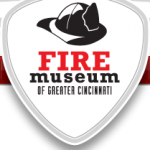 Fire Museum of Greater Cincinnati – SORRY THIS EVENT IS SOLD OUT! Have breakfast with Santa & story time with a firefighter on Dec. 17 (9am-10:15am). Guess what? 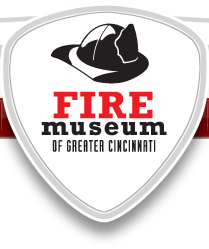 FFC is co-hosting this event with Downtown Cincinnati, Inc., and the Fire Museum. The food will be provided by Whole Foods Market Cincinnati. RSVP early since registration is limited (registration opens Nov. 30). Hope to see you there. 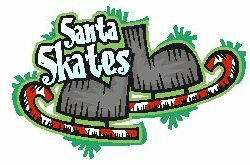 315 West Court St.
Fountain Square – Santa Skates – How fun is this? You can lace up your skates and see Santa whiz around the ice rink on Fountain Square. He’ll be there every Sat. & Sun. from 11am-Noon on Nov. 26-27, Dec. 3-4, Dec. 10-11, Dec. 17-18 & Dec. 24. Great Wolf Lodge Mason – Snowland – Snowland is open Dec. 3-25. There will be daily snow shows in the lobby. They have two special events coming up to help Big Brothers and Big Sisters (donations are welcomed). On Dec. 3 (2-4pm) they will have horse & carriage rides and Santa & Mrs. Claus arrive later (6-8pm) to kick off all the Snowland fun. On Dec. 9-10 & Dec. 16-17 & 23 (5:30-8pm), you can take a horse drawn carriage ride around Great Wolf Lodge and Santa will also be there. Santa & Mrs. Claus will also be there on Dec. 16-23 from 5:30-7:30pm. Be sure to check out the life size Gingerbread houses too. Hamilton County Park District – Brunch with Santa – You’ll want to make your reservations ASAP since these events sell out fast. You can dine with Santa on Dec. 4 or 11 at either 10:30am or 1pm. Brunch is held at the Stonewood Banquet Center in Sharon Woods. Cost is $14.95/adults, $7.95/kids 2 to 12 and free for under 23 months. Call (513) 769-0624 for more information. Holiday in Lights – Santaland – You can stop by Santaland for FREE from Nov. 25-Dec. 23. Santa will be waiting to see you from 6-9pm on Mon-Thrus & Sun. & 6-10pm on Fri. & Sat. You can get yourpicture with him too. There will be lots of other festive fun for you to enjoy at Santaland. 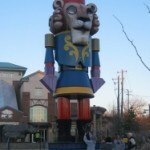 Santaland will be held in the Sharon Centre at Sharon Woods. Holiday Junction – Cincinnati Museum Center – Visiting the Cincinnati Museum Center is magical during the holidays. There is so much to see and do. Make sure you take a tour of the Cincinnati History Museum before stopping by the trains at Holiday Junction which features the Duke Energy Trains. Here you will also be able to visit with Santa. Bring those cameras to capture the moment. Santa arrives on Nov. 25 for their annual tree lighting. Tree lighting is at Noon so make sure you get there a few minutes early. On Dec. 10, they will also have Pancakes with Santa (RSVP early), and on Dec. 18 register for the North Pole Pajama party – Santa will also be there. LM&M Railroad – North Pole Express – Hop aboard for a festive train ride and visit with Santa & Mrs. Claus. Santa’s Elves will also be spreading some holiday cheer. Dates: Nov. 26-27, Dec. 3-4, Dec, 10-11 & Dec. 17-18. 127 South Mechanic St. Lebanon, Ohio. Call (513) 933-8022 for more information. Macy’s Downtown Dazzle – There are so many holiday events downtown. Santa will be the main attraction on Dec. 3, 10 & 17 at 6:30pm as he “rappels down the side of the 525 Vine Building office tower to the Macy’s rooftop at Fountain Square to kick off a spectacular holiday fireworks display” (click here for more info). There will be choirs singing and lots of festive holiday music (free). Find more info on Downtown Cincinnati, Inc.
Macy’s Light Up the Square – Nov. 25 – the fun starts at 6:30pm and the tree lighting is at 7:25pm with a visit from Santa Claus. Story time with Mrs. Claus – Visit Macy’s Fountain Place on Dec. 3, 10, 17 and have story time with Mrs. Claus. Visit with Mrs. Claus right after the fireworks and enjoy cookie and a craft (free). Thanks to Macy’s for hosting. Photos with Santa – Macy’s Fountain Place – Bring your own camera to take some holiday pictures with Santa. Nov. 25-Dec. 23. Click here for hours. Dayton Mall – Magical Season of Giving – Santa will arrive on Friday, Nov. 18 at 6pm. There will be a “Santa SENSEsational Holiday Celebration” to welcome Santa. On Nov. 20, children with Autism will have a special morning with “Sensitive Santa” from 9am-11am. 2700 Miamisburg- Centerville Rd. Call (937) 433-9834. Florence Mall – Santa will ready for some holiday photos. You can visit with him for free but you can also purchase a holiday photo package from Nov. 19 to Dec. 24. 2028 Florence Mall, Florence, KY. Call (859) 371-1231. Kenwood Towne Center – You can get your picture taken with Santa at the Kenwood Towne Center from Nov. 12 through Dec. 24. Click here for the times Santa will be ready for the holiday paparazzi. You can purchase a photo package with MyAlbumPics.com. If you just want to meet Santa, that is free. 7875 Montgomery Road. Tri-County Mall – Santa makes his big debut on Nov. 18 from 3pm-7pm. There will be fun events and free activities. 11700 Princeton Pike. Call (513) 671-0120 for more information. MetroParks of Butler County – Breakfast with Santa – Make your reservations to have breakfast with Santa at the Voice of America park on Sunday, Dec. 11 from 12:30-3:30pm. They have a fun day planned filled with yummy food, surprise entertainment, Santa and crafts. Register online : $16.95/ages 12 & up, $7.95/ages 7-12, $5.95/ages 2-5, and free/2 and under. 7850 VOA Park Drive, West Chester, Ohio. Call (513) 867-5835 for more information. 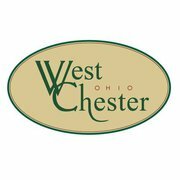 Olde West Chester Christmas Walk – On Nov. 19 from 1-8pm you can enjoy a festive holiday time as you visit the local businesses on Cincinnati-Dayton Rd. They will be decked out for the holidays and you can meet Santa Claus at Book Bums and have your picture taken thanks to Best Buy. There will be a cookie walk, holiday costume contest, chili dinner, petting zoo, elves playland, parade and a lightning of the community Christmas tree plus lots more. Holiday on the Square at Union Centre – On Dec. 10 from 4-8pm, Santa and his crew of merry elves will be celebrating with you. There will be an ice sculptor, songs by the Cincinnati Christmas Carolers, hot chocolate and a craft to take home. Pioneer Christmas – Dec. 11, 1-4pm at Keehner Park. Step back in time and enjoy some traditional holiday tidings and a visit with Santa. We also wanted to let the Miami University Marching Band know how proud we are that they will lead Santa in the 85th Macy’s Day Parade (Nov. 24 on NBC). So set those DVR’s to record the Miami University Redhawks in their rendition of “Santa Claus is Coming to Town”. Click here for more information on the parade and check out Miami University – featured on the bands section. Here’s a video snippet to get you motivated to see them in action. Miami University Marching Band from mumb on Vimeo.